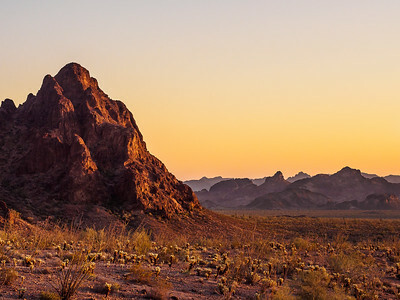 March 17th, 2016: I grew up less than two hours from the Kofa Mountains, and passed nearby many times on my way from Needles to Phoenix, but had never made the time to explore them. 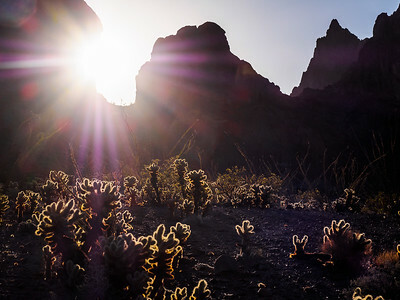 Brandon and I left Phoenix just after lunch and arrived in the Kofa’s about three hours later. 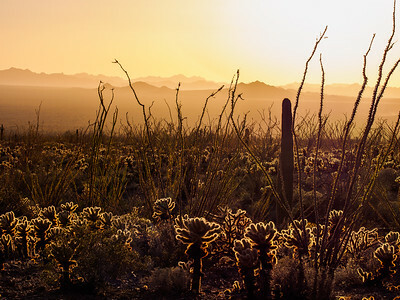 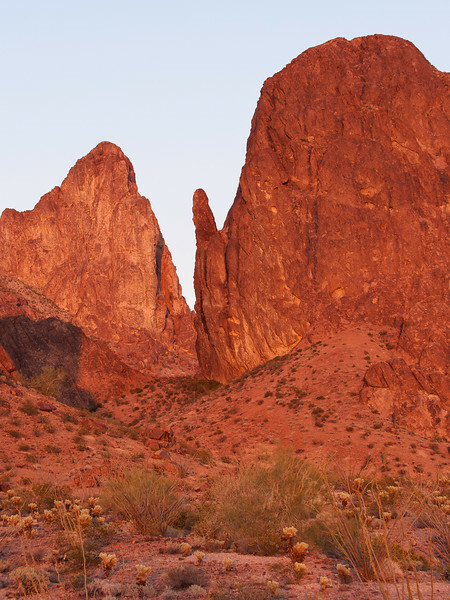 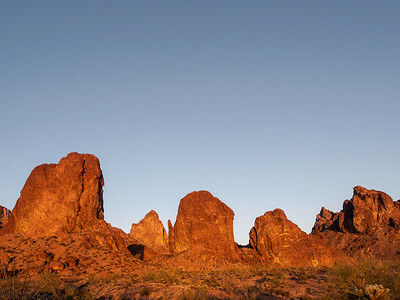 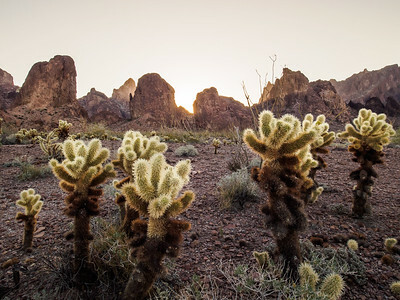 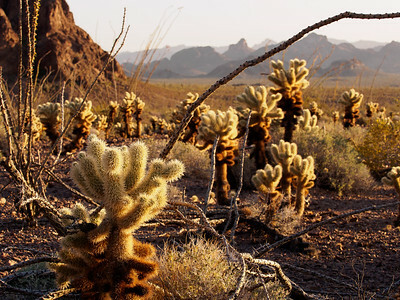 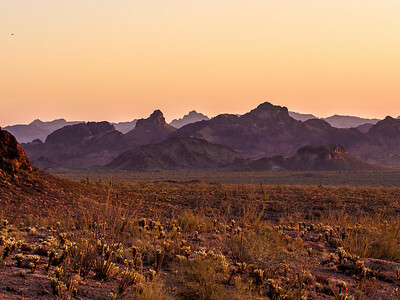 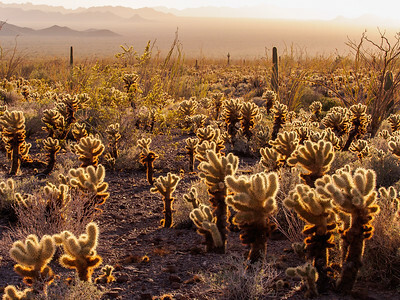 The range is most well-known for Palm Canyon, and the King of Arizona mine, but I was set on camping near and photographing a set of spires off of Kofa Queen Canyon. 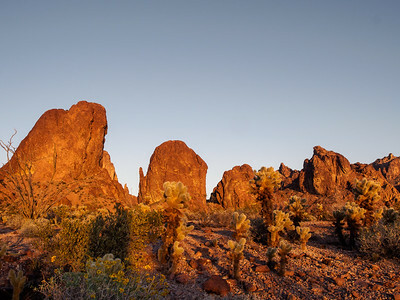 Our plan was for bare-bones camping, so we had camp setup in about 15 minutes after which we read, played video games, and just relaxed for a while until the sun was approaching the horizon, and I spent some time walking through and photographing the Cholla and Ocotillo garden, scouting some spots for sunrise as well. 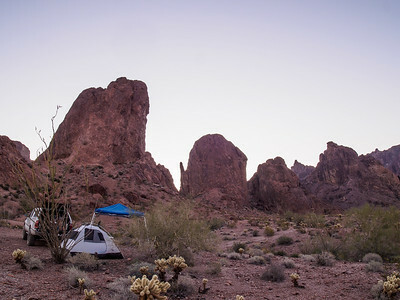 A great, yet cloud-free sunset led to hanging around the campfire after dinner, and eventually going to bed. 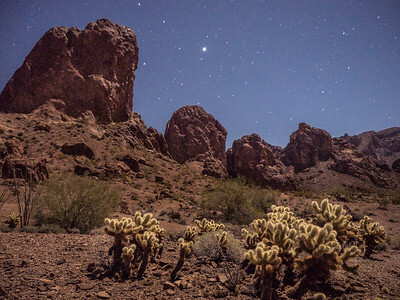 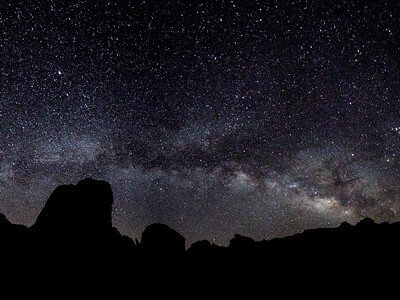 I woke up before 4:00 to start what turned out to be an unsuccessful time-lapse, then a bit later shot some photos of the Milky Way over the Kofa Spires. 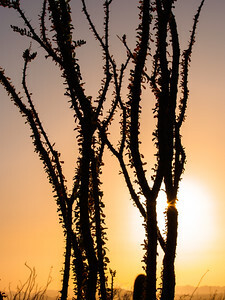 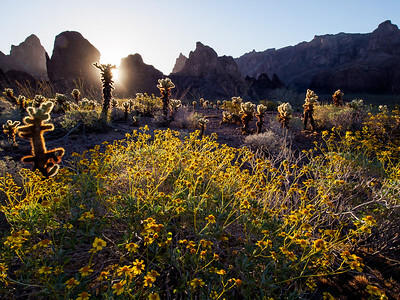 Back to sleep for almost two hours and I was up again to shoot the sunrise between the spires and the few Brittlebush blooms on display. 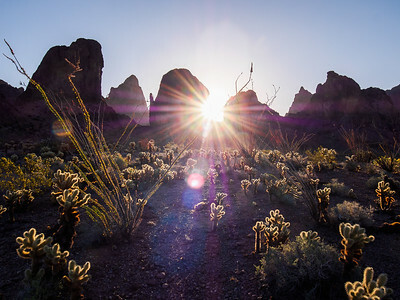 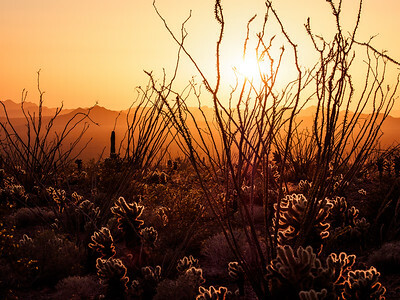 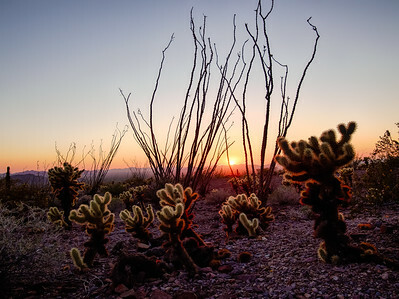 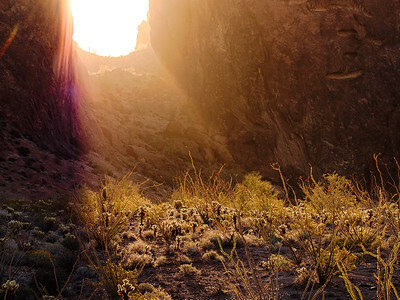 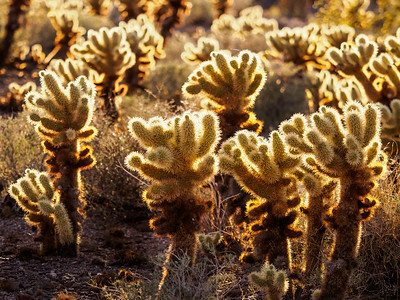 The amazing desert morning did not disappoint, as the sun rose between the spires the play of shadow and light on the desert floor was incredible. 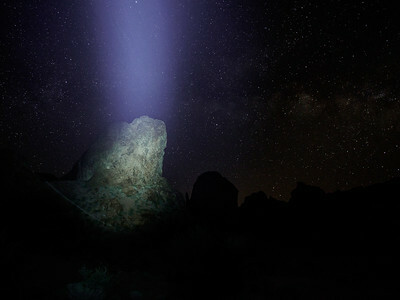 As I was returning to camp, I noticed an amazing sight. 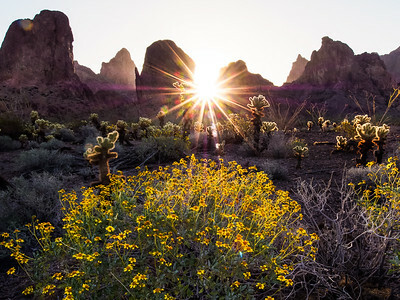 I was standing where the sun was blocked by the spires, but enough light was ‘spilling’ over the ridge between a pair of spires that it seemed as if the ridge was a dam and the sunlight was like water flowing over the top, lighting up the desert floor. 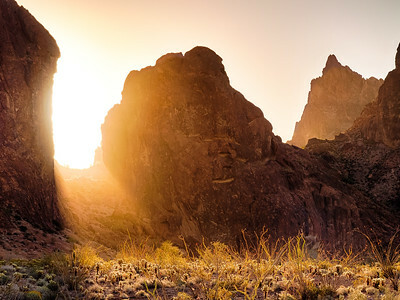 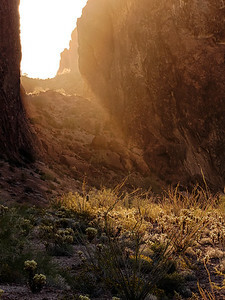 This was one of the most amazing scenes I’d captured during my time in the desert and truly a memorable morning. 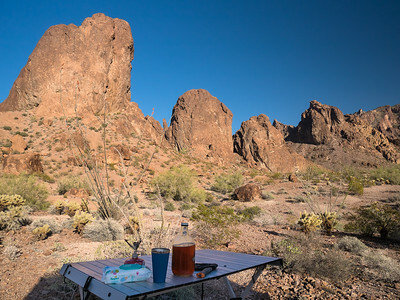 I woke Brandon up soon after, we broke camp, then headed home to return to domestic duties to conclude the week I had taken off from work.